Good bye bicycles, we'll go sailing! 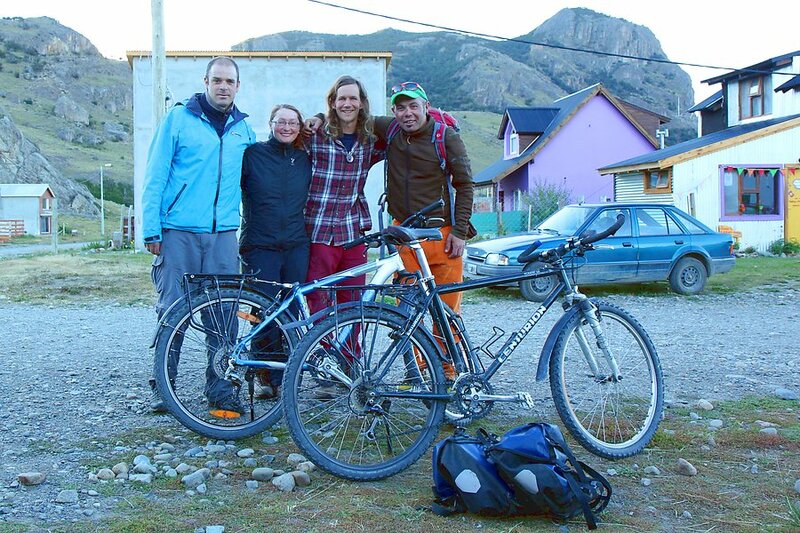 In El Chalten, Argentina we stayed at a kind of cyclists' camp. It was a small house at the edge of the town belonging to Florencia, a local woman who welcomed all touring cyclists to camp in her garden against a voluntary donation to cover electricity, gas and water costs. As it was high season, the place was packed with guests. Sharing one bathroom with more than twenty others required some patience, but it was a great place to meet other cyclists on shorter and longer tours, most travelling south but some north as well. 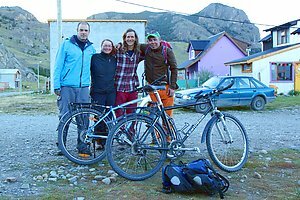 Our time was slowly running out so we asked Florencia if she'd know someone who would be interested in buying our bicycles. It didn't take long before a friend of her appeared and was interested in mine. We said that we'd like to sell both at the same time, the word passed around and soon came another man who was looking for a bike for his girlfriend. We asked for a reasonable price and both bikes were sold. Next day, before the new owners came to pay and collect the bikes, we would have even had a second buyer for both. We learned that it is difficult in Argentina to get quality bikes and the prices are higher than in Europe. There was more interest than we had expected and we ended up even selling two of our panniers and one of the front bags. A big change in our trip and faster than we had thought! However, we had known that we would have to get rid of the bikes sooner or later and had bought them second hand specially for this tour. After selling them, we felt slighly sad but relieved that there was one thing less to think about. 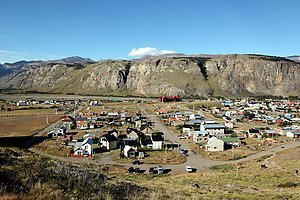 Our next goal was to arrive in Ushuaia, the southernmost city in Argentina about 1000 kilometers further south mostly through the treeless pampa. In between we had to still pick up a package containing some winter clothes from Puerto Natales in Chile. 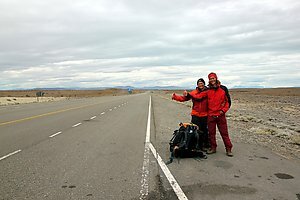 It would have been possible to travel by bus, but we had still over a week of time and decided to try hitchhiking. When travelling on the Carretera Austral, we had often seen hitchhikers by the roadside and without bicycles it was now easier for us too. The way of the thumb worked well. Every time nice people picked us up, we got to practise our Spanish and enjoyed a lot of mate tea as almost in every car the traditional cup of mate was passing around between the passengers. 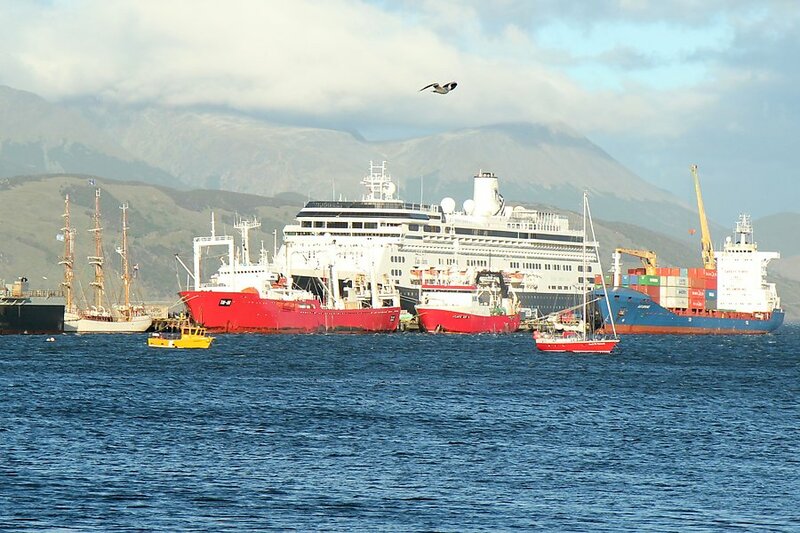 We made our way to Puerto Natales in one day, probably faster than it would have been by bus. There we stayed a couple of days with a CouchSurfing family before continuing forwards. 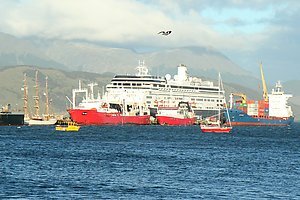 To get out of Puerto Natales was a bit more difficult, but after a couple of hours waiting and walking we got a ride near Punta Arenas, where we camped by the seaside. Next day, the first car picked us up and we only had to change once for a ride directly to Ushuaia. Not only did we get there in time but had also local contacts in the city to spend some time with, perfect. 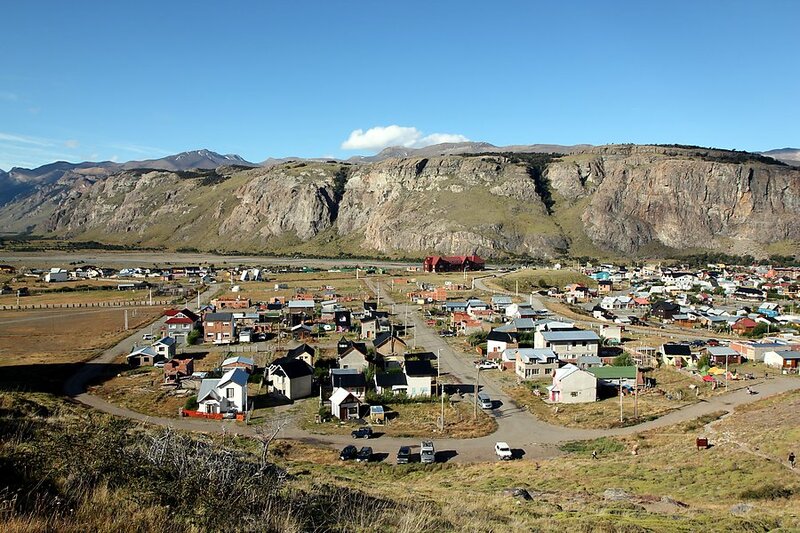 Through a recommendation of another traveller we met in Puerto Natales, we also found a very friendly family from which we rented a room for our last few days in Argentina. Soon after posting this, our next big adventure will begin. Tonight we will board the sailing ship Bark Europa for a 52 day sailing journey to Antarctica, South Georgia, Tristan da Cunha and South Africa. During that time we won't be able to post anything in the blog nor read our emails, and naturally our mobile phones won't work either on the seas. For me, it'll be the longest time without Internet since I started using it 20 years ago. Probably hard, but I'm sure I will survive. :-) It is however possible to follow the progress of the journey via Internet on the Bark Europa homepage. The position of the ship will be regularly updated on the world map and occasionally also logbook entries will be transmitted on the site via a satellite connection. We will write next time in about two months after we've arrived in South Africa. On 24th of August CouchSurfing, the most popular hospitality exchange site, announced a switch from a non-profit status to a corporation, collecting a 7.6 million USD venture capital investment. Quite a few members have expressed disappointment and reacted to the announcement as betrayal of the community. Some have closed their CS profiles and switched to alternative sites such as BeWelcome. Is there a reason to panic? I don't think so. CouchSurfing has been publicly presenting itself as a charitable organization, but it hasn't really been practising charity nor been poor for a long time. The site has raised millions with a questionable verification/donation scheme during the last few years. In addition to maintaining the site, the money has been spent in salaries, free travel and wild lifestyle for a relatively small and closed inner circle of people. Criticism towards the leadership and management has been presented widely, including a a dedicated site and long detailed articles documenting the problems. In the end, after failing to get officially accepted as a charity, the switch to a corporation didn't come as a surprise. The new legal structure of CS is the so called B corporation, which requires a level of social and environmental responsibility, but it's a for-profit entity nonetheless. I think the switch is actually a good thing. It's better to be a corporation than claim to be a charity. New venture capital money and guidance from the investors will most likely help CS to improve their service and respond more promptly to user wishes and complaints. And members are less likely to have false expectations that all their donation money would be responsibly managed and used for good purposes. The income stream from user address verifications will probably reduce so CS will have to come up with something else. Sure, they may continue the verification business, but they cannot label it as a donation any more. My guess is that CS will sooner or later introduce some kind of targeted advertisements, even if they currently have decided against it. People are already used to advertising on many social networking sites, and 3 million registered users with lots of personal information in their profiles would be a good base to start with. Advertisements like “Didn’t find a host? This hostel in the same city would still have rooms available” could even be attractive for users who are mixing various forms of accommodation on their trips. Another path would be to offer extra features for paying members. This is more tricky as people are used to web sites being free. However, instead of extra features there could be related services which require a company behind them. Two simple examples coming to mind would be insurance covering damages caused by guests (similar to what the paid home-stay site airbnb offers) and phone hotlines helping guests to find alternative accommodation in case they have problems with their host. Such services wouldn't make much difference for a seasoned hospex enthusiast but might make the average new member feel safer. A lot of work at CouchSurfing has always been done by non-paid volunteers. An interesting question is how the new CouchSurfing corporation will succeed in keeping up the volunteer labor. Programmers and other core people will probably become paid employees from now on. On the other hand, local volunteers (ambassadors in CS terminology) are likely to continue volunteering as before. Organizing meetings and events and hanging out with other CS members is fun, and there's no reason to expect such activities would die just because the status of the main organization changes. I expect CouchSurfing to continue as the most popular hospitality exchange site at least in the near future. Only a small minority will quit because of the change, and more professional development of the site is likely to attract new members. On the other hand, there are also people who will prefer to use services developed and maintained on a non-profit basis. I see this as an opportunity for healthy diversity in the hospex scene. In order to make profit, CouchSurfing will need to keep growing and make the service attractive for as many people as possible. Meanwhile, alternative sites could gather lively communities of their own, focusing on other values than quantity. Hospitality exchange has been part of my life for about six years now. During that time, the total number of members in the world has increased from one hundred thousand to three million. It's already a huge movement! The growth has had it's side effects, but the core idea has remained the same: opening your home to visitors and being welcomed to other's homes when traveling, without any monetary transactions. It's simply wonderful. We descended from the Alps to Longarone, a small town near Belluno, in North-Eastern Italy. 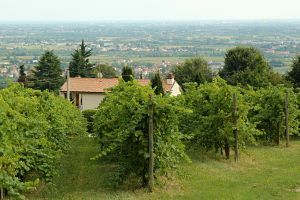 The high peaks of the Dolomites gave way to lower, grass-covered mountains, then hills, and finally to the flatlands of the Veneto region. The route followed small roads and tractor tracks through vineyeards, corn fields, fruit gardens and small villages. On the way, we had a few wonderful stays with CouchSurfing hosts. In Longarone we were welcomed by Gigi, Francesca and their family, who had heard about CouchSurfing from an Italian TV program. We were their first guests. They were first a bit puzzled what they could show us as mountains were the most popular attraction in the area and we had just been hiking for almost three weeks. However, we didn't need much sightseeing — a tour in the garden, chatting, relaxing and family dinners including their own vegetables, local cheese and wine were just perfect. We also got good hints which route to take during the following two days. From Longarone we climbed once more up to 1700 meters and descended to Tarzo. There we stayed two nights with Helio and Lori, a warm and funny Brazilian-Italian couple. With them and their friends we had a tour in nearby Vittorio Veneto old town, followed by more than excellent ice cream in a local gelateria and the most entertaining wine tasting ever hosted by Lori's father, also called Gigi. Helio and Lori didn't speak much English but it didn't stop us communicating in a mix of about five different languages, while enjoying delicious Brazilian food and the friendly atmosphere in their home. One full day walk later in Spresiano we met Francesco, a guy of about same age than us who had recently come back from a 6 month tour around the world. We all had one thing in common: quitting our jobs to travel at least once in our lives. So it was no wonder we had a lot to talk about. :) Francesco had a lot of ideas about how to change his life and be happy. We might meet him again one day in his small cocktail bar on a quiet beach, where he will mix a drink for us. After Spresiano we didn't have any more CS hosts and were relying on hotels and guesthouses instead. We also considered sleeping outside, but without a tent or a mosquito net it would have been a bit tricky. In a few places the personnel immediately guessed which trail we were on, probably thinking "Again two of those crazy Germans walking to Venice". On the flat parts we could have taken exactly the same route by bicycle so it was a good opportunity to compare these two ways of travel. By walking we saw a few more details in the gardens of the houses and it was a bit easier to talk to each other. On the other hand we were limited to about 25 km per day while by bicycle we could have easily covered three times that, without missing much in the scenery or opportunities to communicate with locals. So we sometimes felt a bit silly walking along the roads, but nevertheless decided to go on for the couple of remaining days. After a total of 26 days of walking (including two rest days) we arrived in Lido di Jesolo, a beach resort located about 20 km from Venice. It was a big contrast to all the other places we had been to on the trip. There were hundreds of hotels and restaurants on a few kilometers of shoreline, and of course thousands of tourists on a beach holiday. On the beach there were sections of sunshades and chairs reserved to each hotel, but fortunately the waterline was freely accessible for all. We walked to the waterfront and took photos in our hiking outfit in front of the surprised beach-goers. From Lido di Jesolo it was only a one day walk to Punta Sabbione and a half an hour water bus ride to Venice, our final destination. We spent a couple of days exploring the alleys and canals, photographing the colourful houses of Burano and relaxing on the beach before returning home. There was a good feeling about completing the tour, but it was of course not as important than the experiences during the trip. Overall, walking for four weeks was an interesting experience. The first two and half weeks on the Alps (see parts one and two) were beautiful and the mountains started to feel like home in way I had never felt on shorter hikes. I would do it again, although perhaps carrying a tent and choosing my own route instead of following a book. On the other hand, I don't think it'll be my ambition to walk hundreds of kilometers along roads as some people do. On roads I prefer the bicycle or some other kind of vehicle, depending on the trip. In the picture you can see me and Sandra on the way to Mt. Roan in Norway. She is my new companion on my travels — and in life. We met in Helsinki in March 2009 at a Hospitality Club sauna party and ended up cooking together in the middle of the night. Quite soon after that Sandra came for a few days visit at my place, then for a week, and I also visited her in Memmingen, Southern Germany. Since then we've tried to spend at least one week per month together. Sandra has an organic food store which is great for one of our shared hobbies: cooking. Her brother looked at us once in the kitchen and asked how can we eat all that food. Because it's tasty, of course! We also like to go out and do sports so gaining weight hasn't been a problem so far. Actually Sandra has been more worried of me being too thin and suggested that I should eat more chocolate. 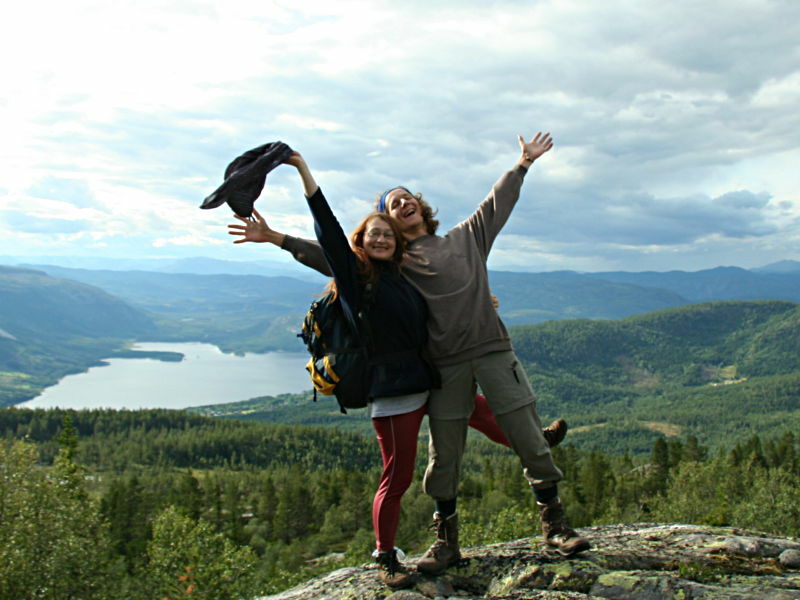 Other activities which we share are hiking, cycling, listening to music, going to concerts and traveling. In the summer we traveled together for six weeks, mainly in Southern and Central Norway. It was a road trip by Sandra's car combined with many hikes in national parks. Mountains and fjords were beautiful although Norwegian weather made it quite a wet experience: out of 31 days there were only two when it didn't rain at all. But we survived and enjoyed five days of sunshine in Finland right after leaving Norway and driving quickly through Sweden. On the road our lifestyles fit together quite well. We're both more into going out walking and wild camping in the nature than booking a plush hotel and lying on the beach. We also contact locals through hospitality exchange sites and stay with them — just as we both did already before when traveling alone. One big difference compared to my earlier trips has been less time spent in Internet cafes and writing blog articles, but perhaps that's not such a bad thing. Life is funny. I never studied German at school or spent much time in Germany but love isn't restricted by country borders. We have both traveled quite a bit and lived abroad in the past. And although we're communicating mainly in English there's now an extra motivator for both of us to learn a new language. This was already the second year I didn't buy any commercially available Christmas cards. Still, it's nice to occasionally send and receive not only email greetings but also good old fashioned paper mail. Letters reach also those relatives and friends who don't read email. Therefore I selected some photos taken during the year 2008, had them printed and wrote something personal at the back side of each one before mailing them out. 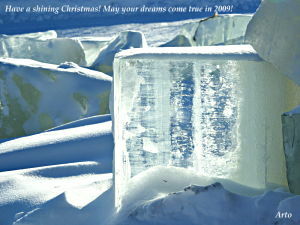 I plan to spend the Christmas with my family, as usual. We'll go to meet my mother's father at Pyhtää tomorrow on Christmas eve, staying at his home in the countryside until the following day. On the 26th we'll drive to Hyvinkää to visit my other grandfather. That's very common in Finland: Christmas is a family event and New Year is more often spent partying with friends. One thing will be different this year: My youngest brother Lari will be missing. He moved to Canada a few months ago to study at a film school and decided to spend his holidays traveling in the U.S. and Canada. It was fun to plan Lari's Christmas present together with my parents: we're giving him "A Day in New York" — consisting of five addresses where he'll have something interesting to see or do, all costs covered of course. Once again I got help from CouchSurfing members, this time in the form of hints rather than accommodation.